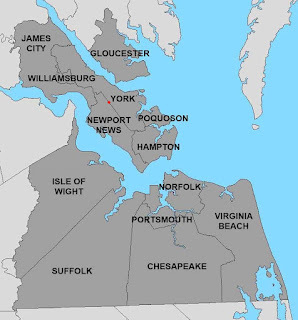 I have listed the top caches in each area around Hampton Roads but there are other caches we personally would recommend. Here are some that come to mind. Friends and fellow cachers - I am compiling this list from memory. If you feel one of yours should be listed here: drop me a line! 1) GC4TTVJ - A Trackable Wormhole - Destination Australia - hidden by SNAP!!! - yep, we are plugging one of our own caches. If you have trackables that you want to travel far distances, then this is the cache for you. Drop your trackable in this cache and several times a year the Wormhole is activated and the trackables are mysteriously transported to a cache in the land 'down under'. Yep, you heard that correctly. And it doesn't cost you a thing!!! Located in the downtown Suffolk area. 2, 3 and 4) - B.Y.O.B series - GC4RHNF, GC4R9K1 and GC4R264 - all 3 of these caches are well worth the drive to the eastern part of Virginia Beach. You will not be disappointed. All 3 were created by the CachinCousinz - they are a very creative duo. 5) GC5TRPC - North of Tower - hidden by snowurchin - a fairly new hide and not to far from the picnic. Just one more cache that didn't make any of the other lists. 6) GC5RAQT - Mate in One - also hidden by snowurchin - as long as you stopped by #5 above you might as well grab this one also. Located a very short distance away from the above cache. 7) GC5KWYP - Twisted - hidden by geospillz - this cache is NOT for the novice cacher. Be prepared to search for some time. THIS IS NOT an easy cache BUT well worth the visit. 8) GC4HJYY - Hide a Key - hidden by pattycake3 - for my friends down in "Da Carolinas" (sorry, it's an inside joke) - this is a really nice cache that is not to hard to find but may take some time for you to open. I may add to this list as the picnic approaches. Stay Safe & Keep Caching. Hope to see y'all at the picnic. Labels: #geocaching, 13th Annual GCHR picnic, SNAP, SNAP!! !